The film opens with an International Space Station intercepting a vessel that contains the first discovered extraterrestrial life form. It is a single cell, but it begins to grow before we have the chance to ask where it came from. Rather than risk bringing it back to Earth, the six astronauts and scientists (Jake Gyllenhaal, Rebecca Ferguson, Ryan Reynolds, Hiroyuki Sanada, Ariyon Bakare, and Olga Dihovichnaya) remain in space to study it. They quickly find that it has the ability to grow and problem solve at a pace they were not prepared for, and soon cannot contain the threat of the alien, which may have been responsible for wiping life from the entire planet of Mars. Even in the simplicity of the storyline, the success of Life lies in its ability to properly balance intelligence with genre thrills. From the exciting opening sequence to the predictable twist ending, Life never slows down enough for audience to question the decision of its characters. At the same time, they are believably flawed enough to create a situation which becomes increasingly catastrophic. At its core, Life is a campy creature-feature which has been given the makeover of an A-list cast and some impressive cinematography. The acting and the camera work may be better than most genre entries, but people don’t typically go to these movies for those reasons. The highlight is typically the creature, which thankfully remained mostly a mystery in the marketing campaign (so much so that people began to theorize this was secretly a Venom movie). Part of the excitement is the suspense of discovery, so I won’t give too much away, but I will say that the monster in this film is given a unique set of properties. The actual design of the creature feels modeled after a few different animals/insects from Earth, but remains unique enough in its behavior to add a touch of originality to the inevitable deaths in the narrative. Fans of gore may be disappointed, though there are several moments that are horrifying without the need to be extremely bloody. Life is far from a masterpiece, but that isn’t what it is trying to be. Rather than giving us another mindless entry into the genre, director Daniel Espinosa has elevated the kind of material that would previously have simply been released as a B-film. Audiences expecting more than exciting entertainment are destined to be disappointed, whereas I found myself delightfully surprised by the quality brought to a screenplay which would have been easy to mess up. Despite the March release, this is exactly the type of summer escapism I would have expected prior to franchises and sequels dominating each weekend release. It may not be original, but at least it’s not another mindlessly formulaic superhero film. This film actually takes chances, whereas most summer releases now feel created by a committee of studio heads deciding what elements are needed to make the most money. 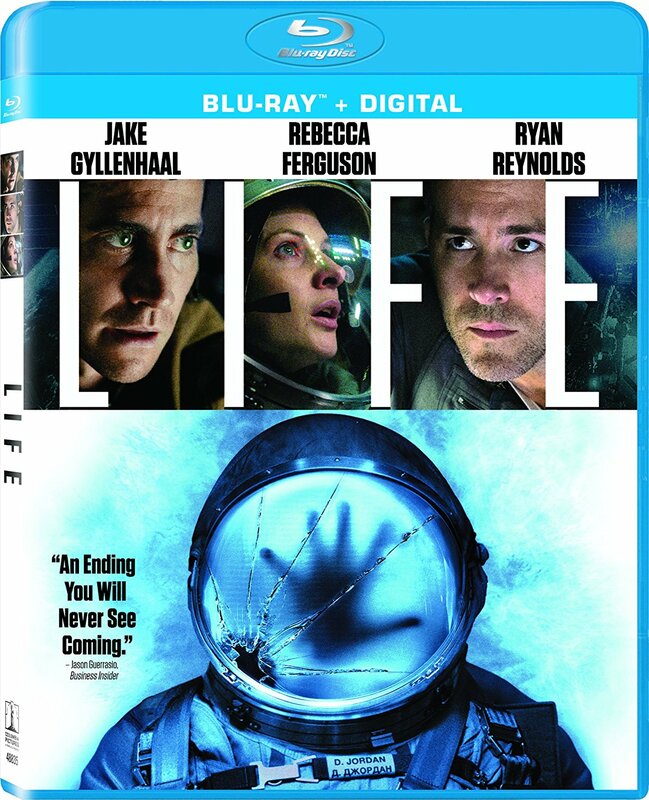 The Blu-ray release for Life comes with a Digital HD copy (though no DVD), and a handful of special features. These include just over five-minutes of deleted scenes, three promotional featurettes, and brief video diaries with the actors in character. The promotional featurettes cover the difficulties of simulating zero gravity, the cast discussing the suspense of an outer space setting for the film, and the creature design. There are also trailers for additional Sony titles.